In 1998 Gail Stavitsky curated Waxing Poetic: Encaustic Art in America for the Montclair Art Museum in New Jersey. This was a landmark museum exhibition, a scholarly survey that placed a historic medium within the context of contemporary art. The exhibition also introduced the phrase “encaustic art,” to a broad audience. In an odd turn of events since then, while art made with encaustic has become ever more visible in galleries and museums, art fairs and art publications, “encaustic art” has gone in the other direction, coming to represent conceptually unsophisticated efforts with the medium. As the author of the book that helped ignite the current interest in encaustic and founder of the first Conference devoted to the study of the medium, I have struggled with this question. I would say that we are not doing what we deny; in fact we are doing the opposite. My personal response has been to professionalize the standards for the Encaustic Conference, to broaden the scope of Conference offerings, and to exhort my professional colleagues to join with me in “raising the bar” in hopes that our collective example will inspire others. Last year I put those ideas into an essay, Encaustic: Art, Craft Hobby. The essay was intended as a tool for discussion. The professionals rallied around it; the amateurs circled their wagons; the folks in the middle took sides. And yet, the issue remains, perhaps more pressing than ever. I asked the ProWax group for their responses to the question posed above. Here’s some of the discussion, edited for brevity and organized for cohesiveness. Elena De La Ville clarifies the problem that Cheryl has just noted: “One of the main differences that I see [between artists and “encaustic artists”] is that those of us who are established artists have studied. We have laid the foundation in our own practice and we are innovators. We have a long track record. We teach. A critical mass in encaustic is populated by amateurs who are drawn to the same medium we were drawn to but with hardly any training in concept or art principles. I’d add that for self-defined “encaustic artists” looking to make a meaningful contribution, opportunities for involvement beyond “encaustic art” are available. Conference aside, there are a number of teaching professionals who offer entree to a higher level of thinking and achievement. They make their presence known on the various Facebook pages that attract those interested in encaustic. However the artists who reflexively slam the door on a way of engaging more broadly are likely to forever remain “encaustic artists”—more weight on a bar that is getting ever heavier to raise. I think of the comment by a visitor to the Swept Away exhibition at the Cape Cod Museum of Art this past June. Surveying the show during a panel discussion, he said, with a combination of awe and authority, “This is what encaustic can be.” It was a high point in an exhibition with many high points. I am ambivalent; call it pessimistically optimistic. I continue to pursue my personal, largely encaustic-based practice, and I’m directing the Conference into a more art-world-focused arena, supported by a visionary co-producer, an immensely talented ad hoc faculty, and hundreds of conferees over the past seven years who are invested in their professional practice or working toward professional goals. I have long said that one may arrive at the Conference an “encaustic artist” but leave an artist, with a broader sense of what is possible technically and conceptually. So to answer the original question, “Aren’t we doing exactly what we are denying?” I would say no, not at all. In ProWax we have gathered and identified as professionals who are working in encaustic. But to Howard’s question—which I’d paraphrase as, “Can we raise the bar without being pulled down by the weight of “encaustic art?”—sadly, I don’t think so. I don’t know why I it took me so long to realize this: Perhaps it’s time to disengage from the weight. Without it, there’s no limit to how high we can raise the bar! We are visual artists. Our efforts should be visible and they should be exemplary. 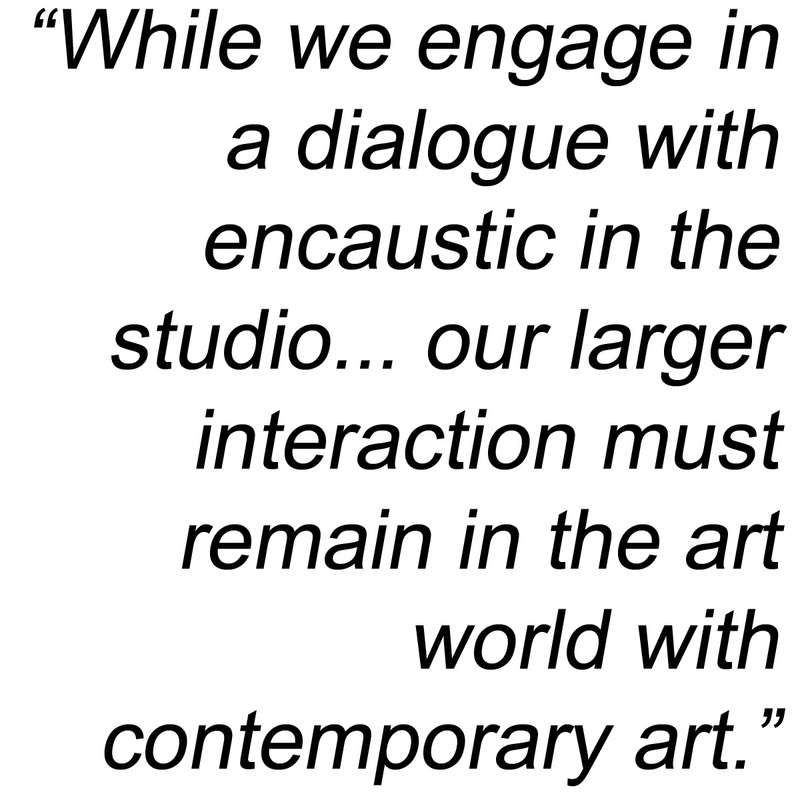 While we engage in a dialogue with encaustic in the studio, and in conversation with one another in ProWax and elsewhere, our larger interaction must remain in the art world with contemporary art. “Encaustic art”, meanwhile, is free to find its own path, likely creating a place for itself alongside macramé owls, decoupage and painting on velvet. 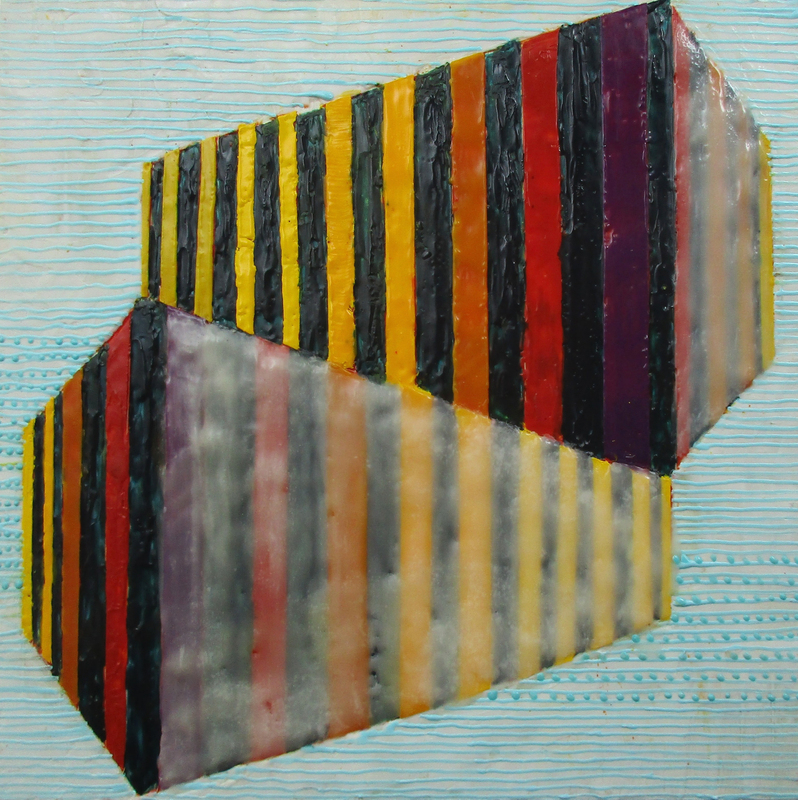 Joanne Mattera is a widely exhibited painter who works in a style that is chromatically resonant and compositionally reductive. 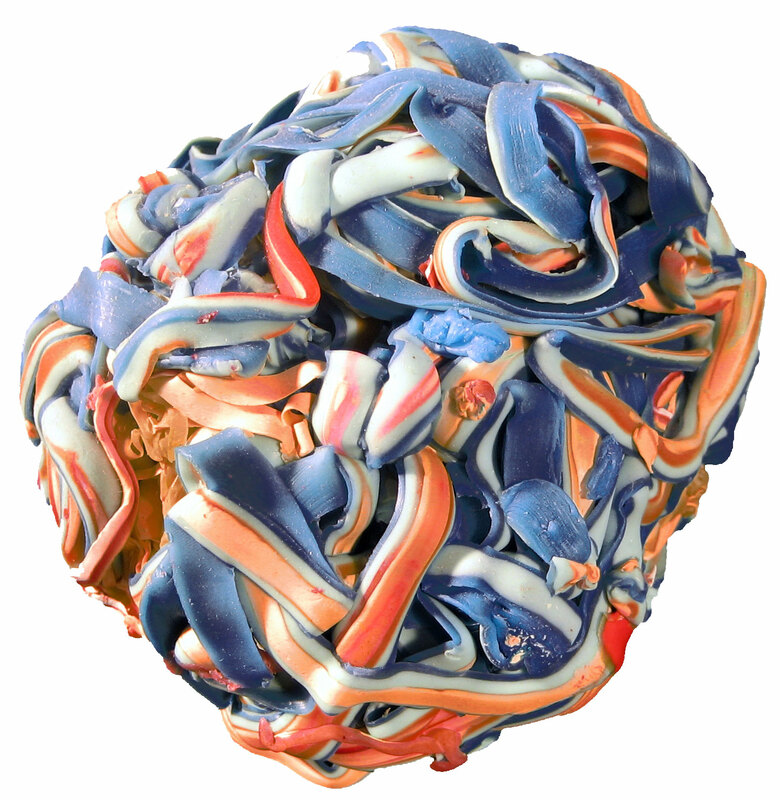 Chromatic Reasoning, her 29th career solo, will take place at Conrad Wilde Gallery, Tucson, in December. Joanne is responsible for two important firsts in the encaustic community: She is the author of The Art of Encaustic Painting (Watson Guptill, 2001) and founder of the now-Provincetown-based International Encaustic Conference, which she produces in conjunction with Truro Center for the Arts at Castle Hill and its director, Cherie Mittenthal. She made her first encaustic painting in 1969, but she is not now, nor has she ever been, an “encaustic artist.” Her coverage of the Miami art fairs can be found on her Joanne Mattera Art Blog in December. The above discussion is truly wonderful and imbued with much thoughtfulness. On this basis, I have to put my 2 cents in (maybe 25 cents with inflation). I have been photographing since age 5, about 60 years, however, I’ve been a photographer for fewer years (early photos were snapshots) and an “artist” for even fewer (started thinking of photography as an art form in early college). Fast forward until after medical training, teaching and doing research in medical schools, etc, all of which stifled imagination. When I joined a local art group consisting of about 100 members and then another group with a similar number I began entering some of their juried shows. After winning first place in their National Exhibition, best of show and being juried into a number of their shows, I started calling myself an “artist”. Then I sought out other media (watercolor, collage, serigraphy and finally encaustic). I don’t believe the quality of my encaustic-containing works rises to the level of my photography, which has also been juried into national and international shows. So, on the basis of the discussion at hand, would I be labeled an artist in photography and a hobbyist in encaustic painting? I think we all go through transformations during our lifelong experiences and that there’s a continuum of expertise that we achieve. My daughter (BFA, School of the Art Institute in Chicago) makes the distinction between “Art” and “art”, but, then, she’s hypercritical, especially of my “A-art”. So this dogmatism of categorizing (real artist, outsider artist, “insider artist” (my spoof) – who cares? Each piece or body of work should be evaluated on its own merits and each artist on what they have produced and continue to produce or what they contribute intellectually to “artistic” endeavors. Not all artists teach well and not all teachers of art are good artists, but they all could be considered “Artists”. Norman… at the risk of too many 2 cents worth of my thoughts. … I think that a person might have work in one medium that is more worthwhile or effective as fine art. That doesn’t mean that person is not professional as an artist.If you feel that you are more than amateur in a particular medium and not another, I just wouldn’t show that work publicly…just use it privately to extend your knowledge and enjoy doing it.Today, I am struggling with one medium and thinking maybe I should have stuck with another one. I just can’t do it though as I am determined to do more with it. I don’t want to think of it as a medium…but as a painting (in my case). Norman: I’ve told this story before, but I think it’s work telling again. I play the congas. I love playing them. I have studied drumming, participated in drumming groups. I listen to a lot of drum music and attend many concerts. I traveled to Cuba a few years ago and sat in on a descarga, a jam session. So you could say that I have played internationally with professional musicians. But by no stretch of the imagination am I a professional drummer. I have nowhere near the training necessary–neither formal or nor under the tutelage of a working professional–and despite my enchantment with the instrument, I know that I have nowhere near the chops necessary to play well. I just love the music, hanging out with musicians, talking shop and hitting the skins. I am in every sense of the word an amateur conga player. I would never dream of teaching drumming, writing about drumming, or drumming outside of a small circle of friends. There is nothing wrong with being an amateur, but it does come with certain limitations. For instance, I do not see a gig at The Blue Note in my future. However, if I were willing to work at drumming every day for years, I might get to the point where I could perform for fun, maybe even for money, at small gigs. So am I a musician? No, I’m not. But I do drum and I do love it. And that’s enough for me. I think your daughter in art school is right to make a distinction between Art and art, just as you would be right to make a distinction between a trained medical doctor who performs surgery in a hospital OR and the guy with a feel for medicine who does liposuction in the garage behind his house. Training counts. Experience counts. Intent counts. Engagement with the larger conversation counts. Listen to what Cheryl McClure and Elena De La Ville have to say about art, training, and experience. Interestingly, I notice that photography, with which you’re quite fluent, gets no adjective. It’s clear you’ve been involved with it for a long time. You don’t need adjectives like “ditigal photographer” or “b/w photographer” or “darkroom photographer” or whatever, because your degree of engagement is broad and deep. When you get to that point with painting–not “encaustic painting” but painting; not just pigmented wax but paint of all kinds– you’ll be a painter. It’s a long road. You’re on it. Thank you both for such thoughtful, attentive comments. I like the notion of presenting “a work of Art” without qualification. Most of the time we are forced to be more specific (gallery, juried exhibit, etc), and, I have to admit, frequently I’m in awe to find out what went into certain pieces. You are right in that the novelty of using encaustic is wearing off and there had better be some “Art” to back up whatever piece is being presented. I also like the notion that I can just have fun with what I’m doing and not worry about any pressures to produce at a certain level. However, there always seems to be something in me that wants to keep improving. By the way, I too play an instrument, the piano, which I played competitively from the age of 8 until undergraduate school. I won superior ratings in the National Piano Teacher’s Guild for 10 years, earning me the Paderweski medal and numerous other awards. My decision to enter pre-med was a difficult one but I figured I’d be able to make a living better as a physician and still be able to play the piano. However, medical school completely stifled creativity and I stopped playing the piano for 20 years. When I finally started back again I hardly could read notes and had to teach myself all over again. It took years to be able to play what I had learned in high school and begin to learn a few additional pieces. I still can’t match the agility of those days but my interpretations are so much better and more satisfying. I mention this because of Joanne’s congo drums story and because of the similarities. I never studied music in college although I was certified to teach (St. Louis Institute of Music) before entering undergraduate school so I have to consider myself not an “Artist” with respect to music. I believe the parallels are interesting and perhaps we can discuss this further in Provincetown in June. Allow me to add one general thought, lest the baby be thrown out with the bathwater. As we are talking about limiting our involvement with wax-specific or encaustic shows, there are a few exhibitions of long standing that go way beyond “encaustic show” and are well worth the involvement of any artist working seriously in the medium.
. Encaustic Conference exhibitions have evolved over time and are now strictly thematic. Three years ago we instituted the Conference Curatorial Program, which gives each of several conferees the opportunity to conceive and produce a thematic exhibition. Additionally, galleries in Provincetown get involved with thematic exhibitions as well. This comment is not a reply to the discussion with Norm, Cheryl, and Joanne. But it is a comment on this article that Joanne wrote. Regarding Cheryl’s comment and Joanne’s suggestion #2, I agree that the discussion should be primarily about the “conversation” or “idea”, not the “technique.” It is interesting that noone asks a writer if he uses a pencil, pen, typewriter, dictating machine, or computer keyboard.